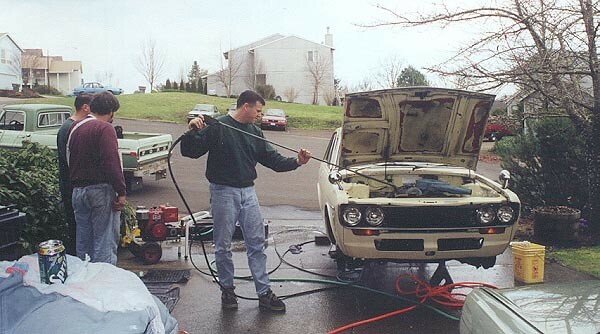 My name is Michael Spreadbury, and I own a small automotive restoration business called Spriso Motorsports in Corvallis, Oregon. 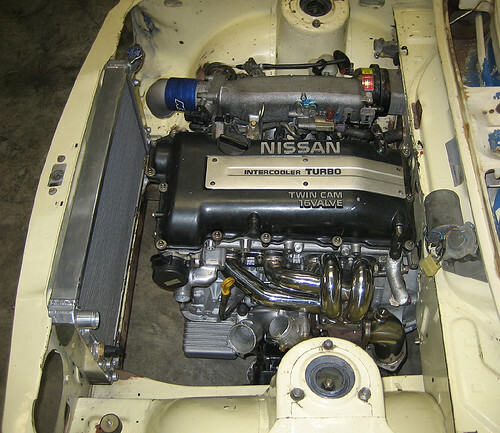 We have dabbled in many different facets in the automotive realm, but our claim to fame the last few years has been building SR20DE(T) powered Datsun Roadsters. Due to professional commitments of my day job, our full-blown customer projects are scaling back, but we are still working on personal projects and providing SR conversion parts for roadster owners. I am a 510 guy. I have been playing with these cars for over 25 years now, and I have owned mild to wild examples over the years. 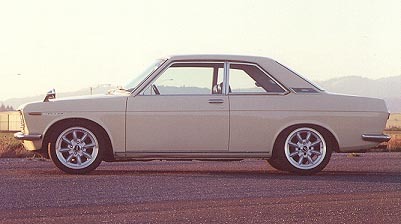 Over the last 10 years I have been heavily distracted with SR20 powered Datsun Roadsters, and my 510 interest had cut way back, but it is time to brush off the dust and get back to work on a 510 again-- I miss them! 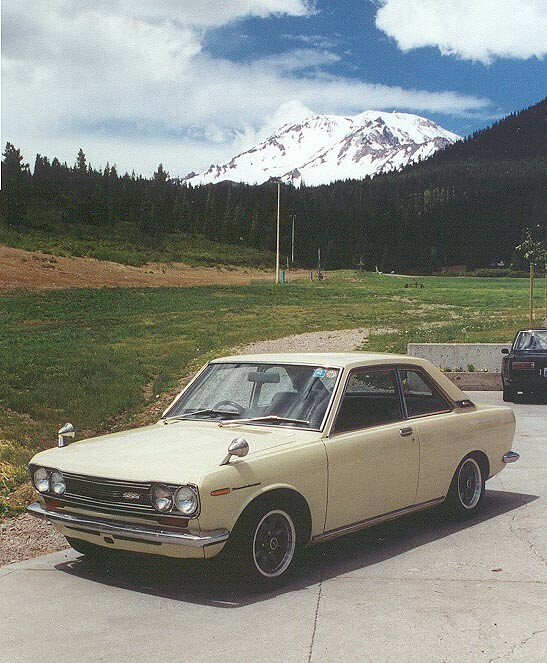 The car had typical rust in the normal areas that you see it on Japanese market cars-- the rocker panels and bottom edges of the doors were rusted, as well as the tail light panel. The car had evidence of skim coats of body filler in several locations, all things that you normally find on any home-market car. On the inside, the interior door panels, headliner, and dash pad were all in excellent condition, and the floors were solid with no rust at all. Trying to figure out how they had got the car so low provided a nasty surprise-- there were NO springs in the front struts. Drum front brakes too... The engine had a nasty tick and every system showed neglect, mostly from not being used we presumed. 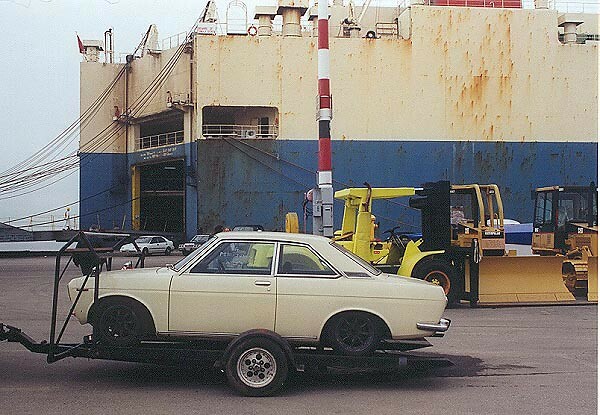 A used L18 and 5-speed were found, a 3-row radiator installed, and a set of 510 struts were slammed in the car to make it roadworthy for Shasta 2000. I was having a blast with the car, but it had no power, and soon the ring lands on the pistons had so much blow-by that it was literally poisoning me as I drove down the road. 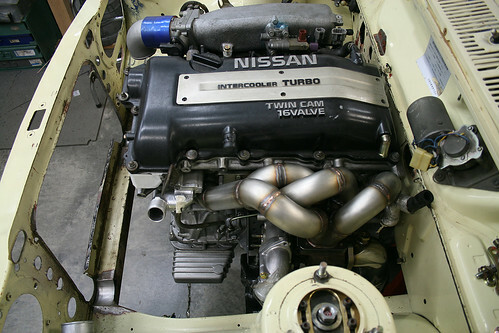 To fix the lack of power, a SR20DET was the logical choice. 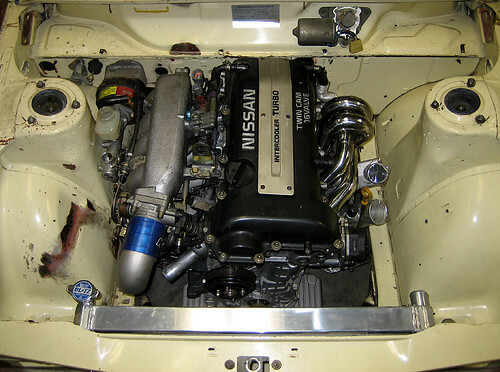 Being that the Coupe is RHD, a turbo engine is an easy fit in the Coupe's engine compartment. 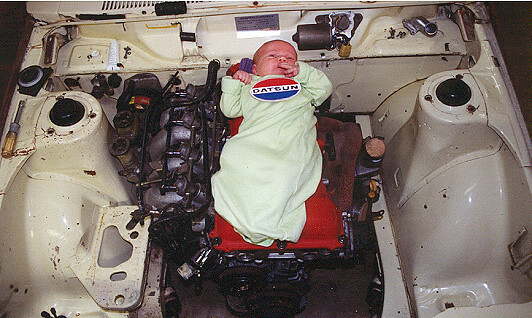 In the fall of 2001, the car was stripped of it's L-series powertrain and a S13 SR20DET was test fit. Fast forward 4-years, and here we are today. Eric has been busy this winter working on his own SR20DET swap, and it has inspired me to get back to work on my own car. 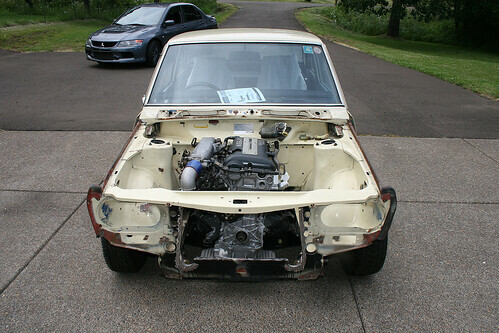 The 68 crossmember and trans mount that we built in 2006 went into Eric's S15 SR20DET project (as seen here: http://www.the510realm.com/viewtopic.php?f=3&t=14174) and I have decided to use a Datsport kit as I am intrigued with the longer control arms that the 810-based front suspension has to offer. 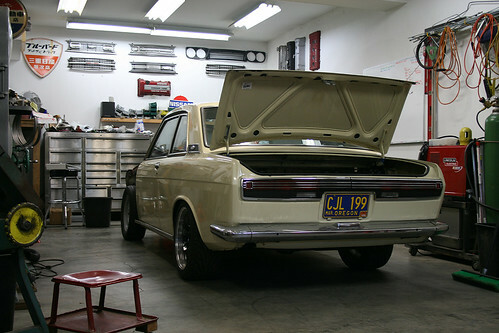 The car is back out of the dark corner of the shop, and it has been cleaned up so we can get back to work on it for awhile. Hi Mike, welcome to the 510 Realm. Your car looks great. I like the custom SR valve cover - a genuine one of a kind! We all look forward to your contributions, ideas, thoughts, input, criticisms, and honesty. It was good to meet you at the Mitty Michael. That copper colored Roadster you built was Amazing. Sweet Looking Coupe Project. I know you will work magic on this one too. The Coupe lives. Long live the Coupe. I didn't know it originally had four-wheel drums. Very nice to see you here, even better to see you getting back to your Coupe too! 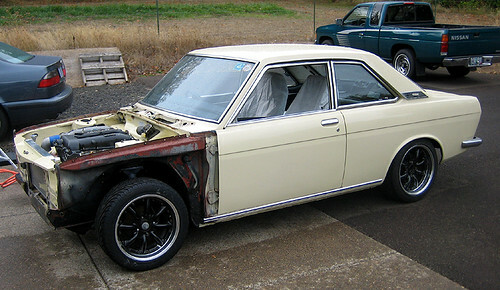 Are you planning a full resto?? I will be following with lots of interest! keep the pics coming. I hope to see it when I return to the states next year. Are you planning a full resto?? Eventually, yes. 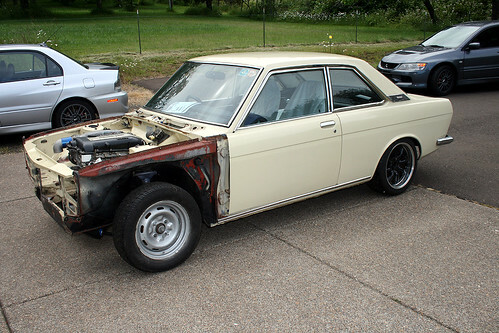 The plan for now is to get the car running and driving again, drive it, work out the bugs, figure out what I am going to change, and then tear it down for the full-blown body work and paint job. 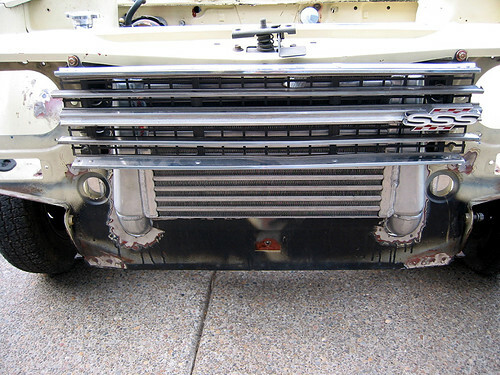 Like I mentioned earlier, it needs numerous rust repair on the rocker panels, tail light panel, etc. but that is outside of the scope of the project right now. 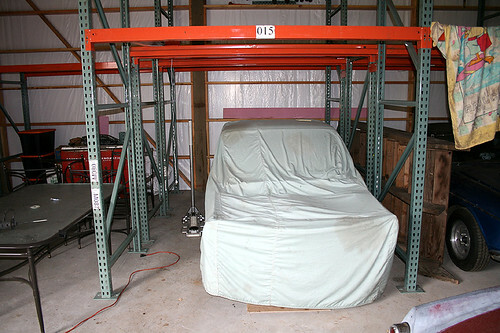 The car as it sits is a good 10-footer, and I am ok with that, it is what it is. S14 SR20DET/stock turbo/stock ecu/MAF to get it running. Adjustable crossmember of some sort, rear disk brakes, all of which needs to be determined. Sentra SE-R Brembo front calipers, rear??? Michael!! Long time no see (talk). Congratulations on the forward progress, look forward to seeing more. I have been collecting and building parts for this project for a long time, and today was a good chance to do more test fitting so we can come up with a game plan on what we are going to need to do to get this all together. 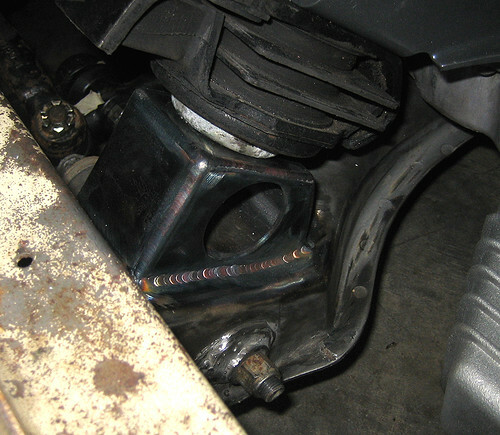 As I mentioned earlier, the struts are based on S12 200SX units. 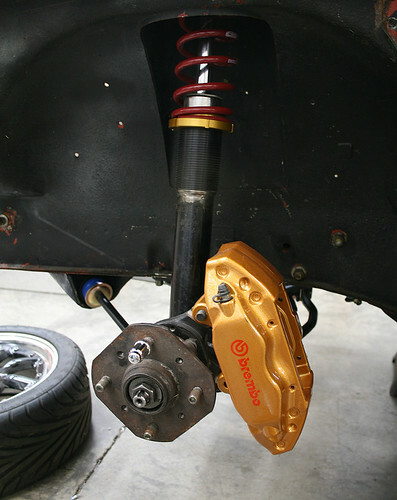 These have been shortened to use a Tokiko Illumina MR2 insert with a standard coil over kit. The camber plates are Office units that I robbed off a Japanese market S14 Silvia that we scrapped in Japan. These were test fit for the first time today with the Sentra SE-R Brembo's test fit as well-- I want to squeeze these under a 16" Watanabe wheel, and we are almost there-- it is very, very close. 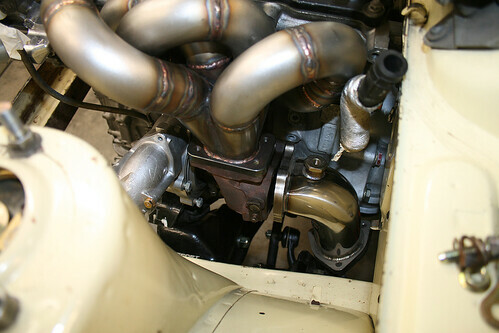 I also had a custom built stainless downpipe that I bought in Japan-- it should work out fine after the mounting flange is cut off and we modify it to suit. So far things are looking good. 510s are so generous on space compared to a roadster-- this is going to be a much easier job than what we have been working on the last few years! I will update as more work gets completed! Great to see you're working on your car again. 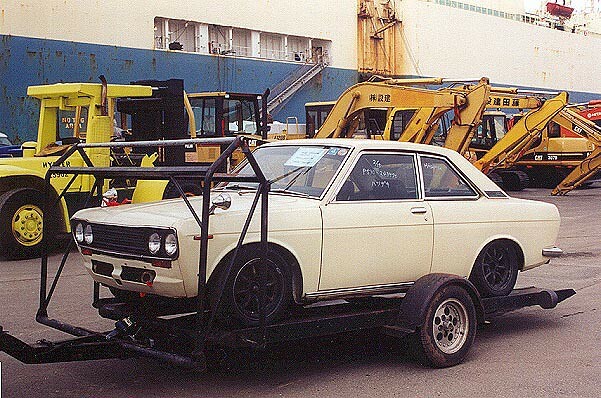 I've always wanted to know more about this car after seeing images of it all over the net. Not much done yet, but so far I've picked up new lights, brakes, SR20det, wheels, steering wheel etc. I used about the same down pipe and just cut off the 3-bolt flange and put it on a speader, spread it to just about 3 inch, then welded a V-Band flange to it, worked great with no leaks and it's really easy to remove the exhaust too. That is exactly what we are going to with this one. Once you use a V-band clamp you will never go back to 3-bolt flanges! We put them on all of our conversions!